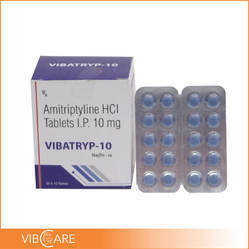 As we are instrumental in supplying excellent quality Amitriptyline HCL Tablets, we are named amid the celebrated names in the industry. To stock our product for wholesale distribution, we have a state-of-the-art storage facility equipped with the latest inventory control management system. It enables us to meet bulk or retail requirements with ease. Side Effects Skin rash, headache, face swelling etc.